USA Fencing, the national governing body for the sport, recognizes fencing clubs that have exemplified excellence to their membership and our sport. Recognizing clubs that work creatively to attract new fencers to our sport while retaining long-time members is a priority to USA Fencing. USA Fencing recognizes that, without the efforts of local clubs, stability and growth in the sport would not be possible. The Club of Excellence Program recognizes one club in the United States that exhibits outstanding commitment in each of five areas. 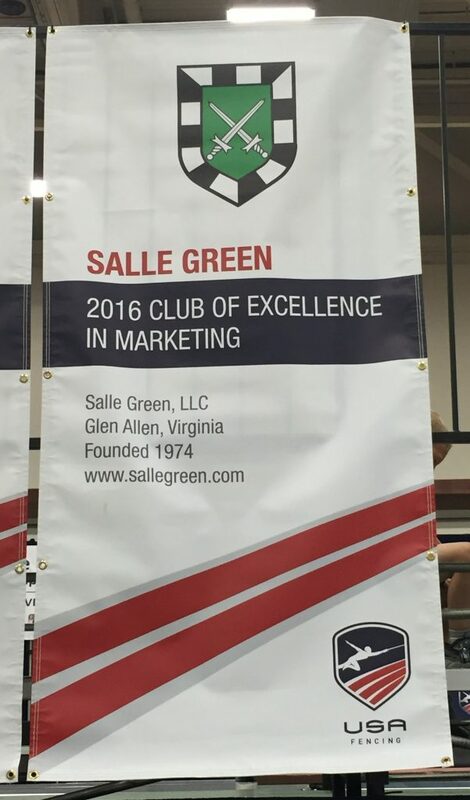 Salle Green is the 2016 national honoree for excellence in marketing both our club and our sport. Salle Green is the only fencing club in the country that has simultaneously been recognized for excellence by both USA Fencing and the United States Fencing Coaches Association (as a Center of Excellence for coaching).